How is everyone? I am good, holy crap we are down to about 1 month!!!! In honesty i have been a bit of a vain girly girl my whole life. I’ve done dance, cheerleading and gymnastics. I have no problem leaving the house without makeup on and it doesn’t take me hours to get ready but i enjoy being a woman. That being said i have been trying to figure out how to remain somewhat feminine out of the trail. I will be dirty, sweaty and smelly; my hair will probably be up 80-90% of the time and ill be in clothes that will be progressively getting looser and looser…..and grosser and grosser. I won’t have any makeup on for close to 6 straight months and will be wearing the same outfit almost everyday. Knowing all of this, i have decided to make an effort in small, but still practical ways. 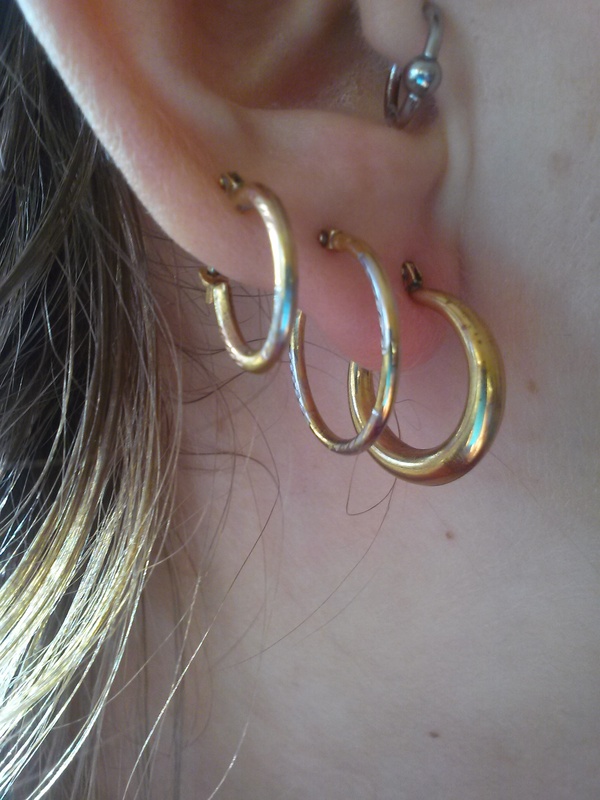 I bought cute hoop earrings to wear on the trail, it is amazing what simple earrings will do. Hoops are a little more sanitary than studs when being left in for long periods of time since they allow more breathability. 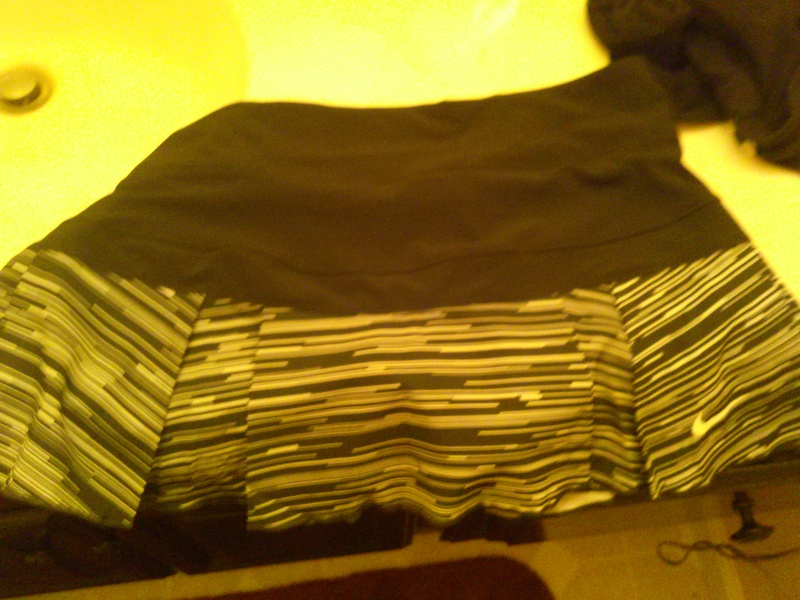 And i bought a workout skirt, technically its a skort. It has spandex shorts underneath. It is comfortable and it is wicking material. So i can be comfortable, practical and still cute. I know i am a dork, but being able to be a little girly out there is something that is important to me and i think will help me deal with the constant dirt and grime. What do you think about me trying to maintain some femininity? I saw 3 “moms” on the trail last year and one had big hoops in and they were having a grand time out there. They were great fun. Cute skirt! I think it’s important to keep true to yourself, so good for you doing a littl girly things here and there. You are beautiful and don’t need a drop of make up for that and you have full pretty curly hair so you can make an up do look good. It’s gonna be great for your skin to not have make up on for that long but are you gonna have any products to use? How about bringing body spray or perfume? I’ll have like shampoo, conditioner, body wash etc for town stops, but no body spray or perfume. I’m still toying with the thought of bringing deodorant or not, people do both on the trail and deodorant doesn’t make much of a dent in the smell lol. Deoderant is a waste. You get used to not having it and you don’t really smell not having it as everyone’s in the same boat. Lol Yea I was thinking about maybe just carrying like a travel size one for when I’m in towns. I’m still fighting myself on it.